It has been a beautiful weekend and also kind of a difficult weekend for us. It was beautiful outside this whole weekend, in the high 60s and just lovely. Considering just a week ago, I was writing about the snow day, it's a little like a miracle. Jeremy has been suffering from a bad case of hives this weekend. He always gets hives after a routine cold/flu and often times it is worse than the original illness. I promised not to post photos of this bout of hive-y-ness, but his whole face was bloated enough for him to look like another person (I was thinking Mike Ditka). He spent much of the weekend in bed downing Benedryl trying to avoid the trip to the urgent care place which we (actually he and my parents - who were trying to convince him to go to the ER instead of the urgent care place) ended up going to this morning at 10 am. A prescription of prednisone later, he is deflating nicely but still very itchy. Vince's birthday party part deux (aka, the school friends party) was at Mr. Cheese's house Saturday at lunch. He (Vince, not Mr. Cheese) could not have been more excited. It was a little trying for me, my wingman - Jeremy was already very swollen and feeling lousy - so I was trying to fly solo. I hate flying solo at Mr. Cheese's. 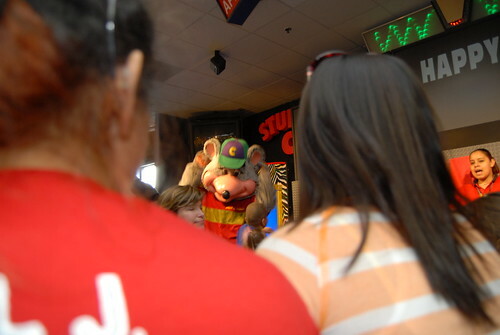 First of all,I probably qualify as the world's worst mom but I hate Chuck E. Cheese. In fact, I hate all those kid kind of places. They are loud and germy. If I never go into another one that is fine by me. And, without your wingman. Speaking of wingman. I became allergic to cats and penicillin after pregnancy. The penicillin made me break out in hives from the inside of my ears to my tongue to places no one should ever have to itch. I know TMI-but it was horrible. I was miserable. I was the dermatologists "patient of the week". Seriously, they took pictures and everything for a paper he was going to write. It was a terrible experience. So give "wingman" my sincerest sympathy because I would not wish that experience on anyone. Except maybe Chucky E. Cheese.